Your eyes are not decieving you, this is a real sycamore seed coated in 24k gold making it very robust. As you can see the detail is very clear.With metallics and nature being in fashion I thought this would compliment any summer outfit and with its warm colours, take you into winter. 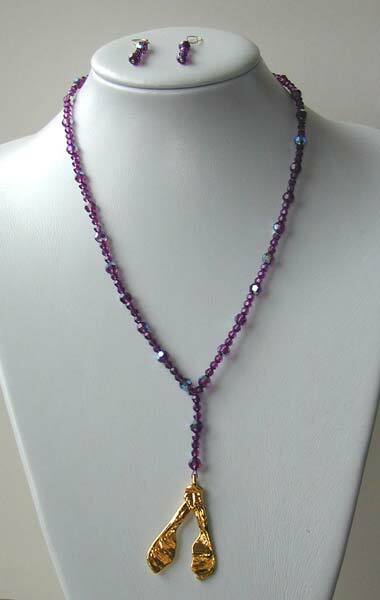 I have teamed the rich gold sycamore seed pendant with bold purple swarovski round beads.The AB coating on the bigger beads gives them an added dimension. This necklace is 20" long fastened with a gold filled hook(gold filled is very hard wearing)with a 3" drop, the sycamore seed making up half the length of the drop.The length of this piece would make it a perfect accessory for this seasons maxi dress. To accompany this necklace I have made one and a half inch drop earrings, using gold filled findings and the same swarovski beads as the necklace. There are more of this type of necklace to come so make sure you come back to take a look.